Production and design that are in true harmony with nature. C.R.D creative environment is close to the tidal salt-water marshes of the Thames Estuary, the call of the sea birds and the wind in the reeds are never far away from the consciousness, hence the designer has a heightened awareness of sounds and timbre which influence this range of rich mellow, easy listening amplifiers. The Hi Fi enthusiast will be delighted with these quality products, detecting the slightest nuance of recorded sound whilst able to deliver huge waves of distinctive audio at full volume with brilliant clarity. C.R.D have worked with you to bring a new and improved range to the market place. 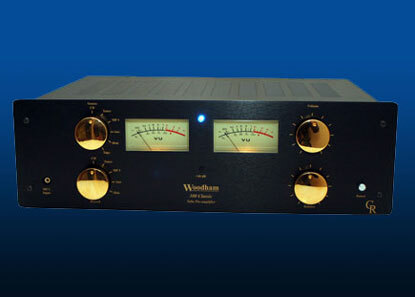 Three decades of global experience in audio engineering delivers reliable, spectacular results. Strict manufacturing controls are enforced at every step of production. Electronic testing of components and sub-assembles is undertaken at various stages of manufacture with the results logged against their serial number providing a positive reference for all items produced in the factory. Electronic testing of components is undertaken at all stages of manufacture with the results logged against their serial number providing a positive reference for all items produced in the factory. The final test ensures that our products give you the optimum sound performance. 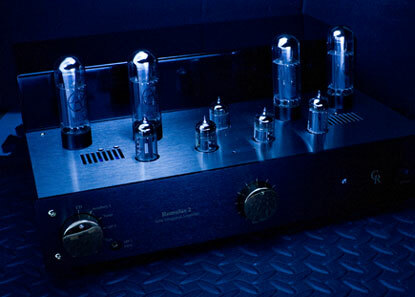 The design for Romulus originated as a high quality integrated amplifier at a price competitive with mass-produced established rivals and inevitability compromises were necessary in the selection of materials and components. Replacing or revising an amplifier with the reputation that Romulus established is no easy task when the product has such a renowned track record. In this latest incarnation Romulus comes of age as a no compromise individually hand built high-end integrated amplifier. Among the many changes are redesigned output transformers including 4 ohm and 8 ohm outputs in addition to improved frequency response resulting from improved winding techniques. The new power transformer is combined with a new multi-rail power supply assembled on a separate printed circuit board that reduces interference effects to the audio circuits. Demand for a moderately priced tube phono pre-amplifier has led to the design of Hestia, a carefully engineered unit with a well defined frequency response adhering closely to the RIAA curves. Hestia always displays fine characteristics when used with a good turntable and cartridge, and will match easily with any of the CR amplifiers, or indeed many other types. Benefits from concentrated research into RIAA pre-amplifiers by the CR design team has helped to set Hestia apart as a well thought out product. Music remains clear and sharp, retaining its melodic quality untainted by poor electronics. Components are all stringently specified and tubes are selected for the lowest noise and tied within tight gain characteristics. The amplifier is well finished with a pleasing external appearance that will harmonise well with CR's other products. The amplifier is supplied with a small separate external power supply which is attached to the main unit via a locking plug and cable. A completely new MM and MC phono pre-amp/equaliser is planned for 2015. It will be a 2 box design with a separate power supply, two levels of power supply will become available during the year. This all tube design includes convenient user selection of pick up cartridge input loading and capacitance. Front panel mounted selector switches are planned to allow the user to select the ideal settings for a wide range of cartridges. CR's flag ship 6C33 monoblock Artemis will join the new product line up in 2015. Extensive re-design, the result of recent development work, is underway. A revised larger chassis accommodates an improved multi-rail power supply that benefits from significantly increased smoothing capacitance thanks to the increased space. Improved output tube biasing will simplify power tube replacement. The choice of balanced line (XLR) and common mode (RCA) inputs remains as does the smooth and detailed audio presentation. Users will have the choice of zero or low feedback operation.